Samsungs RF263BEAEWW 25 Cu. 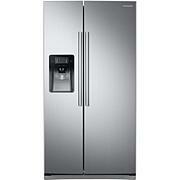 Ft. French Door Refrigerator, in white, has a large storage capacity and an external water and ice dispenser. The IceMaster ice maker in the refrigerator makes up to 10 lbs. of ice per day so you are sure to have plenty on hand for family and friends. The Power Freeze and Power Cool feature drops the temperature in each compartment within minutes. 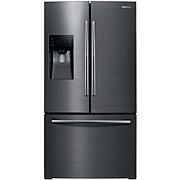 The Twin Cooling Plus System and Cool Select Pantry with temperature control will keep your food fresher, longer. 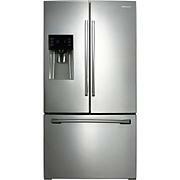 Plus, you will save money while conserving energy with this Energy Star-rated refrigerator and a handy alarm that alerts you when the door is left ajar or open for too long. This refrigerator has space for everything and cooling technology to keep it all fresh. We love this fridge!! Tons of room, very modern, love love love it!! If you are on the fence about ordering it, just do it, you won't be sorry! !